Resettlement and Rehabilitation (R&R) Plan forms a part of the Environmental Impact Assessment and Management Plan Reports (EIA and EMP) and is assessed and approved by the Expert Appraisal Committee (EAC) of Ministry of Environment, Forest and Climate Change (MoEF&CC) for according Environmental Clearance to the project. The R&R Plan for project affected families for ongoing projects has been prepared based on National Policy for Rehabilitation and Resettlement, 2003 and as per National Rehabilitation and Resettlement Policy, 2007 (NRRP-2007). For new and upcoming projects the provisions of the R&R Plan would be according to the Right to Fair Compensation and Transparency in Land Acquisition, Rehabilitation and Resettlement Act, 2013 and its amendments which come from time to time. The R&R Plan is implemented in association with the concerned State Government, representatives from project affected families and other stakeholders in the area. Considering the plight of those who have sacrificed their resources for the larger benefit of the society, ways and means has to be explored and implemented to protect their rights in general and the rights of vulnerable sections in particular, as an attempt towards sustainable developments. In the process, NEEPCO explores various viable alternatives and select the one causing least displacement or adverse impacts. Therefore, a detailed socio-economic survey is conducted before formulation of R&R Plan for the project affected families (PAFs) so as to assess the socio-economic and socio-cultural set-up of the affected families and local people. In future, in addition to Socio-economic aspects, a separate chapter on socio-cultural aspects based on study on Ethnography of the area will be included. For effective implementation & monitoring of R&R Plan of a project, NEEPCO in consultation with the concerned State Government forms a Project R&R Committee headed by Administrator for R&R (rank of District Collector of the concerned State Government) and Head of the Project being the Member Secretary of the committee. Construction/grant of/for cattle /poultry sheds. Land development and protection measures against sediment flow. गSite development for village land. Construction of sanitation and sewerage facilities. Construction of religious worship place. Construction of post office building. Grant for opening fair price shop. Construction of park and playground. Medical facilities- primary health centre. Cremation ground / grave yards. Cultivation and management of soil and water conservation in hills and hill slopes, in terraced lands, selection of crops and varieties as well as other cultural practices for better production. Management and upkeep of cross-bred cows. Management and upkeep of improved pigs. Management and upkeep of ducks. Management and upkeep of goatery. After the Resettlement Census Survey (RCS) has been conducted; NEEPCO invites objections and suggestions from all persons likely to be affected through a notification made through the concerned State Pollution Control Board to the Gram Panchayat and affixing copies thereof at prominent places. A copy of the findings of the RCS is kept at Public consultation and Information Centre, District Collector's office and office of Head of the Project where the PAFs can see the details and file any objection/suggestion in writing within 30 days of issuance of notification. NEEPCO considers all objections/suggestions so received and finalise the findings of survey. a) Kameng Hydro Electric Project (Arunachal Pradesh). Homestead land: Land for construction of house @ 0.02 ha per family. House to be constructed for 99 PAFs with a plinth area of 50 sq. m. per PAF. Granary of 7.5 sq. m. to be constructed for all 99 PAFs. Cattle/Poultry Shed of 40 sq. m. to be constructed for all 99 PAFs. 1.50 ha of Agricultural land and 1 ha of Horticultural land to each PAF. Land Development: 45 ha through Bench Terracing and 238.5 ha land development. Transportation/Displacement Grant of Rs.3500/- per PAF. पRehabilitation Grant of Rs.2,500/- per PAF for 12 months. Training Facilities: Training programmes in upkeep of cross breed cows, improved pigs, ducks, goatery, weaving and designing, handicrafts, mushroom cultivation. Rs.2,000/- per family for agricultural planting materials. Rs.1,500/- per family for horticultural planting materials. Rs.30,000/- per family for 25 families for 2 cross breed cows. 10 layers for poultry rearing for each PAF @ Rs.75/- per layer. Basic amenities and infrastructural facilities in settlement site: Planning and development of R&R site for housing and other civic amenities such as approach road, drainage, water, electricity, sanitation etc. construction of community hall, sanitation and sewerage, religious worship house, post office, panchayat ghar, school, fair price shop, market, play-ground, veterinary services, free treatment and medicines to the oustees in the project. Status of R&R activities of Kameng Hydro Electric Project (Arunachal Pradesh). The R & R committee as required has been constituted by the Govt. of Arunachal Pradesh vide memo No. PQRS/A-465/98/2214-25 dated Itanagar, 8th Sept. 2006 with Deputy Commissioner, West Kameng District as Chairperson. The R&R scheme is to be executed over a period of 3 (three) years through the District Authority and NEEPCO would release the fund in phases in commensuration with the progress of work. Land required for the implementation was identified in consultation with the villagers of Bichom and Yayung village (Project Affected Families – PAF). The 1st meeting of R&R committee was held on 25th Oct. 2007 in the Conference hall of office of the Dy. Commissioner (DC), West Kameng District. Survey of land identified for R&R of affected families have been conducted jointly by the representatives of Deptt. Hydro-Power Development (DHPD) and NEEPCO in Dec 2010. A Monitoring Committee has been constituted for monitoring the R&R scheme against the Project. The list has been finalized on 16th Jun 2011 in the chamber of DC, West Kameng District. The proposal of NEEPCO for village Infrastructure and Economic Rehabilitation scheme shall be revised keeping in view the location and practical requirement of the PAFs and area. A total of Rs.3760.25 lakhs has been approved by NEEPCO till date for R&R works being undertaken by Deptt. Hydro-Power Development (DHPD), Govt. of Arunachal Pradesh. 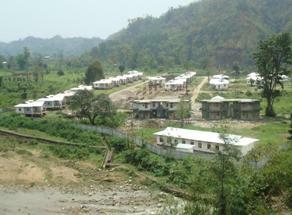 Site Development of both villages completed. Water supply to both villages done. Infrastructure works are in progress. Till date an amount of Rs.1564.74 lakhs has been released in commensurate with the progress of work. Employment to local ST people of Arunachal Pradesh and affected people has also been given. Total of 88 persons have been appointed in different categories against this project. Land for relocating 38 houses @ 150 sq. m./PAF. Provision of Infrastructure facilities @ 25% of house plots. Financial assistance for provision of cattle-shed @Rs.3,000/PAF. Financial assistance for transportation. @Rs.5,000/PAF. One time financial assistance for House Construction to all 38 PAF. Financial assistance of Rs.10,000/- for construction of working shed/shop. Basic amenities and infrastructural facilities in settlement site: Planning and development of R&R site for housing and other civic amenities such as approach road, power supply, water supply, sanitation facilities etc. construction of community hall, place of worship, post office, panchayat building, fair price shop, space for market, park & play-ground, primary health centre, free treatment and medicines to the oustees in the project. Govt. of Arunachal Pradesh has already constituted the necessary R&R Committee for implementation of R&R plan for Pare H.E. Project. The first meeting of the committee was held under the chairmanship of D.C., Papumpare Dist. on 18th March, 2011. The representatives from the PAFs requested D.C. to set up the proposed model village to be constructed under R&R Plan at Sopo village. Subsequently the R&R Committee visited Sopo village on the 29th of April, 2011 to ascertain the feasibility of the proposed area for establishment of model village for re-settlement of the project affected people.The land for model village has been acquired and handed over to NEEPCO by district administration on 1st June,2012 and necessary payment amounting to Rs.256,50457.00 has been released by the Corporation to the District Authority towards land and other assets compensation on 27th April,2012. D.C. Papum Pare District vide letter dated 7th September, 2012 submitted an estimate amounting to Rs.14.92 Crores for establishment of Rehabilitation and Resettlement scheme for the project affected families on the notified and acquired land for Pare H.E. Project at Sopo village under Doimukh Circle. Subsequently, a revised estimate for an amount of Rs. 15.18 Crores has been forwarded by D.C. Papum Pare District. So far an amount of Rs. 15.00 Crores has been released in three installments of Rs. 5.00 Crores each. Construction of approach road to model village, internal roads, cross drainage work, boundary wall, retaining/protection work, RCC spur, school building, Teacher’s quarter, B/Barrack (school), Medical building, 35 nos. Rehabilitation cottages, Doctor’s quarter, B/Barrack (Medical), Market shed, Worship place, Community hall, Cattle shed, Playground and avenue plantation have been completed. External electrification work and execution of water supply scheme are in near completion stage. Employment to local ST people of Arunachal Pradesh and affected people has also been given. Total of 34 persons have been appointed in different categories against this project. All 16 affected families have been rehabilitated through the Govt. of Tripura by acquiring additional 6.73 acres of Govt. Khas land. 27 nos. of families residing in Chun & Rub village had been shifted to Potin village duly developing the new rehabilitation site with water supply. Necessary electrification has been provided to PAFs. 7 families from Rub village opted for CGI sheets and water supply for their temporary shifted houses at Emchi Happa and were provided the same. Employment to 108 nos. people was given to the land affected (directly and indirectly) who were STs of Arunachal Pradesh during construction period (1989 to 1996). R&R scheme has been implemented at a cost of Rs.83.173 Lakh.